So much for JDS having the best boxing in MMA! Discussion in 'UFC Discussion' started by Don Mike, Dec 30, 2012. I think it was obvious yesterday that JDS' boxing is not the best in MMA... I think Anderson has that title now. Who do you think? Silva's got the best striking game period. And yes, it is above Jose Aldo. Only boxing? in UFC probably Edgar. Anderson's beaten very few good boxers. He's not Number 1 boxer in MMA. edgars head movement and footwork is awsome but is boxing is kind of basic. Would love to see Hunt vs JDS. 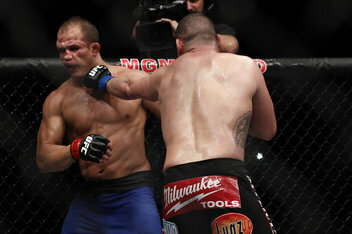 If JDS keeps his hands that low Hunt would KO him for sure! He has beaten Franklin, Forrest, Belfort, Hendo ... all look like they cant stand with him at all. These same guys have used their striking to win World Titles in mma. Anderson always had the best boxing in mma. JDS still has the best hands at heavyweight though, along with guys like Hunt. This is true, but that doesn't mean they are great boxers. Nick Diaz's Stockton Slap ALL DAY. Anderson and Edgar when it comes to that crisp, technical boxing. Nick for the entertainment value. Just out of interest, who would you say has the best boxing in mma? Can you imagine Bones getting hit like that if Sonnen at MW can rock Anderson I think he can do it to Jones Probability is very low. But that punch is what caused the Sonnen Dominance in the 1st Anderson fight provided Silva's TDD is not the best in his Aresenal. If Jones gets rock like that can he survived? No point in discussing who is the best. There's a lot of good "boxers" in MMA (contrary to what some might say) and there's a lot of unorthodox boxers that happen to be very effective. It's pointless to argue over who is better because there's far too many factors to take into account. You're not going to find out who the best boxer in MMA is unless you have them fight it out with straight queensberry rules. Boxing in MMA is generally technically terrible. But if I had to choose, I'd say Arlovski. Only Maldonado, Anderson and the Diaz brothers have technique that is anywhere near as good in my opinion. Andrei trained with Freddie Roach and it shows, too bad he has a fragile chin though. Freddie Roach in an interview a while back said that Anderson is the best boxer in MMA at the moment, and i doubt much has changed.